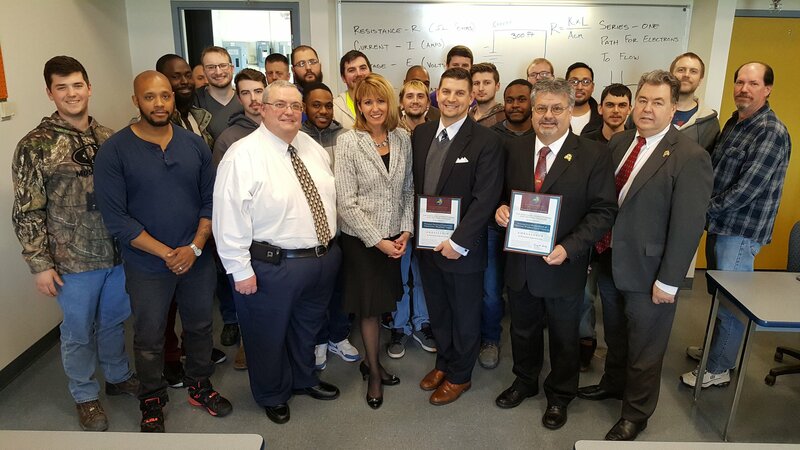 (From right) Local 24 IBEW Business Manager Pete Demchuk, Local 24 President John Rankin, MD Chapter NECA Representative JT Thomas, Labor Secretary Kelly Schulz, Baltimore JATC Training Director Neil Wilford and a group of apprentices commemorate joining the Maryland Apprenticeship Ambassador Program. BALTIMORE (Feb. 12, 2018) – Maryland Labor Secretary Kelly M. Schulz today welcomed the state’s oldest registered apprenticeship sponsor to the Maryland Apprenticeship Ambassador Program. The Joint Apprenticeship and Training Committee for the Electrical Industry of Baltimore, a registered apprenticeship sponsor since 1961, joins the state’s incentive program to help raise awareness about registered apprenticeship. Comprised of the International Brotherhood of Electrical Workers Local 24 and the Maryland Chapter of the National Electrical Contractors Association, Inc., the Joint Apprenticeship and Training Committee has a long history of training electrical apprentices. Over the past 30 years, 1,331 electrical apprentices have completed apprenticeship training. Today, 343 electrical apprentices are in the program. Apprenticeship ambassadors voluntarily cultivate and strengthen relationships with key stakeholders, encouraging job seekers and businesses to engage in apprenticeship opportunities. For their commitment, ambassadors receive special recognition from the Maryland Department of Labor, Licensing and Regulation, customized advice and counsel on navigating the Maryland Apprenticeship and Training Program, the latest in apprenticeship news and emerging workforce trends, and valuable media exposure. Since the beginning of the Hogan administration in January 2015, the number of registered apprentices has increased by nearly 20 percent. Today, more than 9,500 apprentices work in over 230 different occupations. In 2017, 15 new registered apprenticeship programs were created and seven were re-activated, resulting in a record year for the program. The Maryland Department of Labor, Licensing and Regulation (DLLR) is committed to safeguarding and protecting Marylanders. We’re proud to support the economic stability of the state by providing businesses, the workforce, and the consuming public with high-quality, customer-focused regulatory, employment, and training services. For updates and information, follow DLLR on Twitter (@MD_DLLR), Facebook and visit our website.